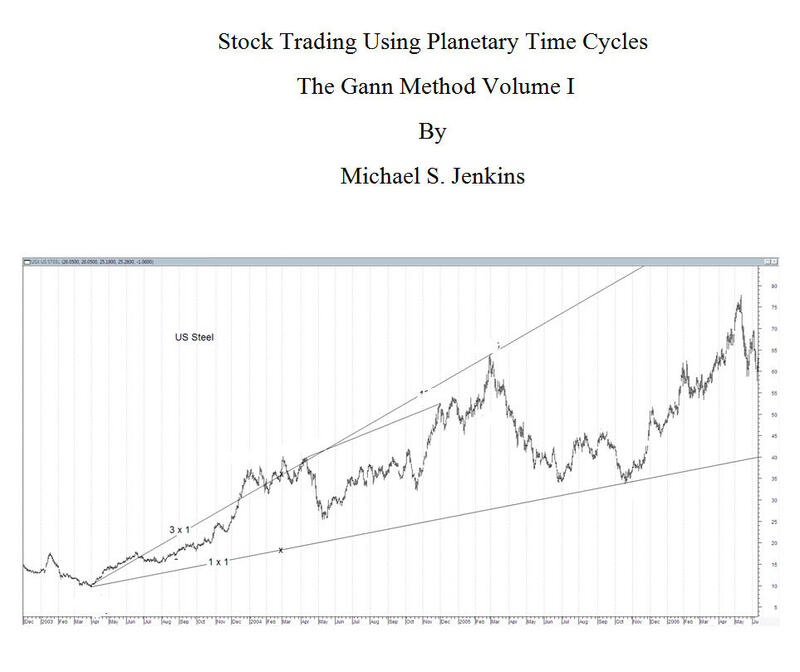 Michael S. Jenkins' Trilogy on the Gann Methods of using planetary movements to forecast market turning points and price targets is now available. These three volumes tell you everything you will ever need to know about how W.D. Gann forecast markets and much more sophisticated techniques discovered by Mr. Jenkins. 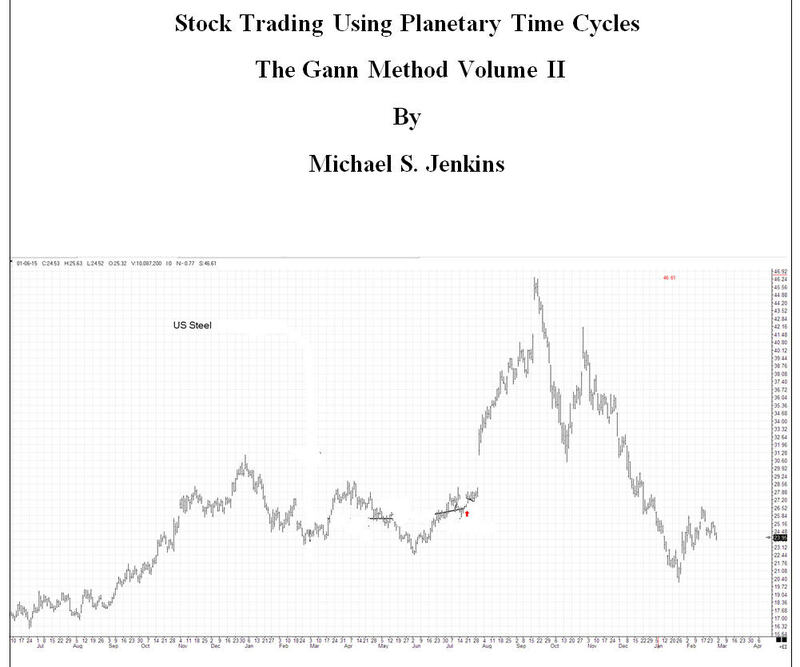 1) Stock Trading Using Planetary Time Cycles - The Gann Method Volume I- $425 including planetary calculation software needed for all three volumes. The practice of astrology has been around for thousands of years and is rooted in the Bible which states: Genesis 1:14 'And God said, Let there be lights in the firmament of the heaven to divide the day from the night; and let them be for signs, and for seasons (my emphasis), and for days, and years'. God later commanded Moses to set up the Jewish calendar as a Soli-Lunar one with the first day being the conjunction of the Sun and Moon. This will be an 'eclipse' calendar with the new moon Solar eclipse and the full moon Lunar eclipse. The twelve Tribes of Israel and the twelve disciples of Christ represent the twelve constellations of the zodiac and Jacobs' blessings of his twelve children describe in exact detail the nature of these constellations for horoscope delineations. Ezekiel 21:30 'Shall I cause it to return into his sheath? I will judge thee in the place where thou wast created, in the land of thy nativity'. This refers to the 'natal' or birth horoscope and God's judgments come from how one handles the challenges set up at the moment of birth represented by the planets and house positions. God need not interfere in our lives every day- he has set up the cycles of 'tests' for each individual to be judged on and set in motion at the time of birth. In any event the three volumes reveal much more about the Bible and its astrological origins (along with its literal historic stories) and why Deuteronomy 18:10 does not apply to stock market forecasting. Below are more detailed discussions of each volume with a 'pdf' download that shows numerous chart examples and tables of contents. I can assure you that it is a very worthwhile book that for the first time will teach you what you really need to know and learn about the 'Gann' method and why you can now finally stop that ridiculous scaling of all your charts that never works. This book will teach you how to draw the specialized Gann Timing Angles that are precise to any scale on any chart. You will also understand much of the secret coding in my other books and why various techniques I revealed in those books are really astrological in origin and use. I am putting out this 'book' in the form of a three ring binder notebook since I will include computer discs with it and plan to update sections to mail you as time goes on to give you real time examples for registered buyers. If you ever wanted to know what the 'law of vibration' is or how you can forecast a high or low weeks to months ahead of time like Gann did then why not learn it from a professional trader who has used it on a daily basis for the past thirty-six plus years? It is only 'Volume I' so it can't cover all of the most esoteric stuff but it will get you on a firm footing as to how to go about solving any market problem concerning trend and reversal points as well as a good understanding of how and why the planets are important to the human race and have been since the beginning of time. You will finally be able to go back to that old Gann course you bought years ago and know what he was secretly alluding too with all those cryptic sayings and cycles. This book is a serious book for serious students who want to learn the 'Gann' method of trading with the planets, and it is full of proprietary material so refunds and returns will not be allowed. This material is copyrighted and not to be copied or disseminated without the authors permission. Cost is $400 US, which includes all postage and shipping anywhere. Volume III is much different than Volumes I & II since it covers the horoscopic method of creating and interpretating a birth horoscope and making forecasts based on that time. 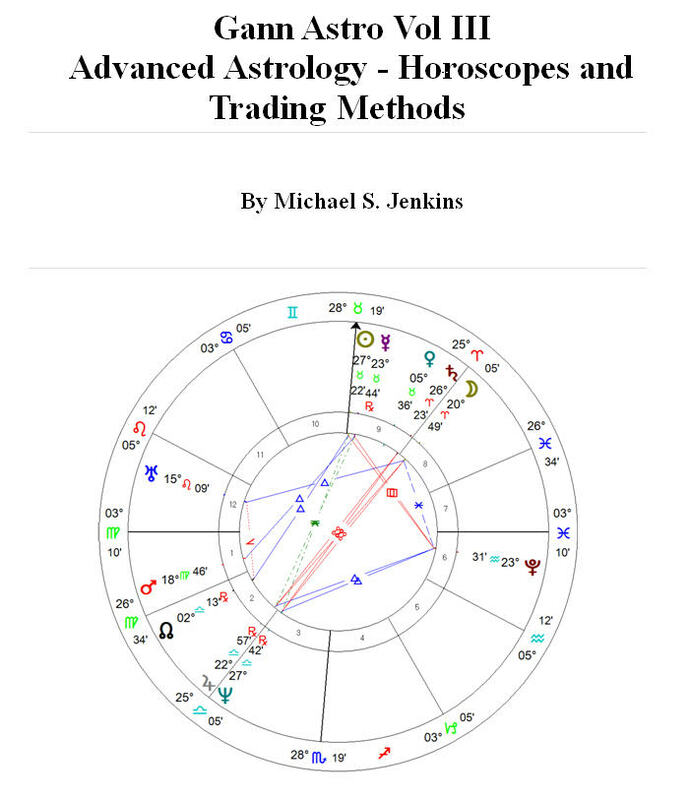 This volume covers all the horoscopes and conjunctions of the planets you need to follow and shows many extremely sophisticated and secret horoscope degrees that predict the major highs and lows in history. There is much numerology involved with these horoscopes and this is why no other astrology course or books will help you. This volume shows these secret number cycles set up at birth that give the final highs and lows many years into the future. There are also many other trading methods and advanced uses of the Square of Nine and secret retrograde calculations that any one of which would be worth the price of this volume alone.